Create filesystem folders from Shotgun. Create folders on disk for a Shot, Asset, Sequence or other Shotgun entity directly from inside of Shotgun. The Shotgun Pipeline Toolkit will read its configuration and create a standardized and consistent folder structure on disk. You can also run the app in a preview mode which lets you do a "dry run" and see what files and folders would be created on disk before actually doing it. Shotgun Pipeline Toolkit has a built in system that handles the creation of standardized directory structures based on a configuration. 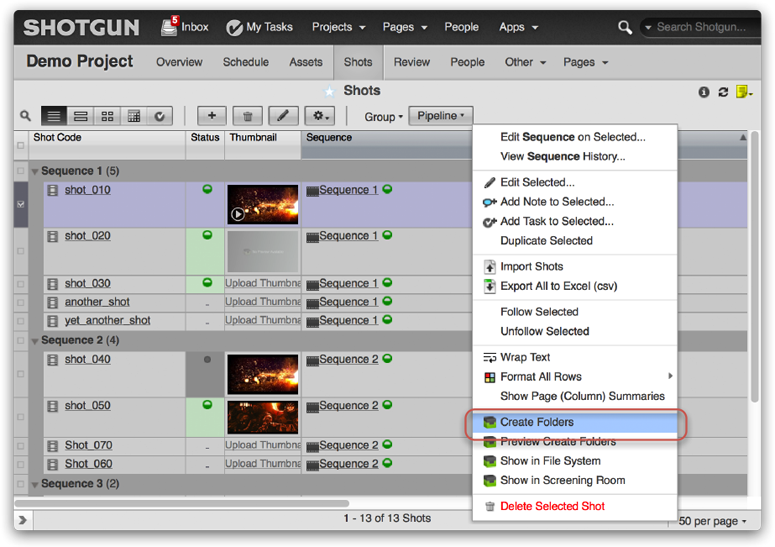 This makes it easy to quickly produce consistent file system layouts for multiple shots. This App hooks up the file system creation API methods in the Sgtk Core API with Shotgun. 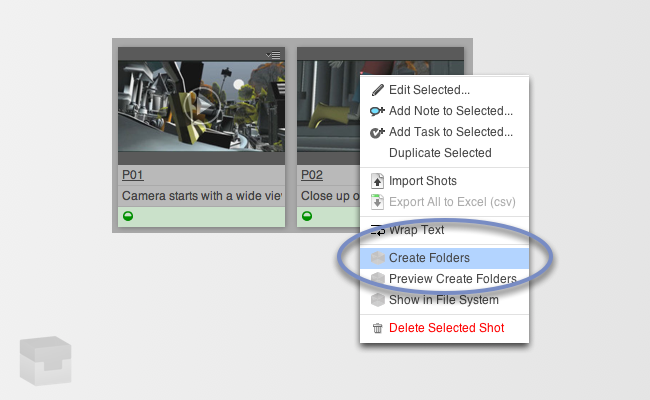 This makes folder creation an easy task; just select a collection of Shots or assets and click the Create Folders action. Simply select one or more Tasks, Shots or other entities (depending on the configuration). 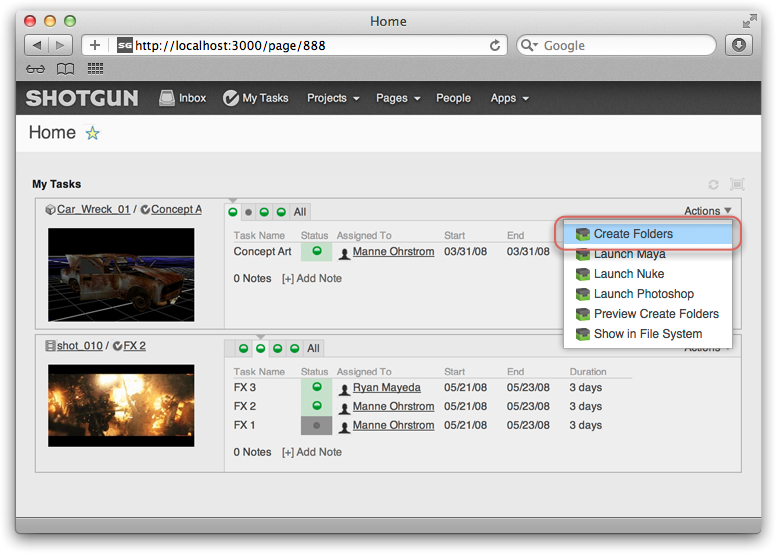 Now select create folders from the action menu. Once the process has completed, you will get a report of how many folders were created. If you have access to the Shotgun Pipeline Toolkit, you also have access to the source code for all apps, engines and frameworks in Github where we store and manage them. Feel free to evolve these items; use them as a base for further independent development, make changes (and submit pull requests back to us!) or simply tinker with them to see how they have been built and how the toolkit works. You can access this code repository at https://github.com/shotgunsoftware/tk-shotgun-folders. You need Shotgun Pipeline Toolkit Core API version v0.13.0 or higher to use this. You need Engine version v0.1.0 or higher to use this. Description: An optional parameter which lets you limit the visibility of this app. If you for example put in ['Artist'] as the value for this parameter, any user belonging to the shotgun permissions group Artist will not be able to see or execute the App. Description: An optional parameter which lets you turn off this app on certain platforms. If you don't want it to appear on the Shotgun Pipeline Toolkit action menu for a platform, just include it in the the deny_platforms list. Valid values are Windows, Mac and Linux. Minor fix to how paths are logged to the console on Windows. We now escape Windows path backslashes in a specific case that caused leading underscores in folders created to not present properly to the user in Shotgun after folder creation. This did not cause any problems other than what was presented to the user upon completion, so functionally the app is the same as before. Updated to make use of Shotgun's support of markdown. Renames and support for the new name Sgtk. Updated to be 0.12.5 compliant. Minor tweaks to make the app python2.5 compatible. First Release with the new Tank API.